We explain what the grid method is, how it is taught in primary-school maths and how it is used to multiply a two-digit number by a one-, two- or three-digit numbers, when multiplying amounts of money and when multiplying decimals. What is the grid method (or box method of multiplication)? The grid method is a written method used to teach children multiplication. It involves partitioning numbers into tens and units before they are multiplied. In some schools the grid method is referred to as the box method of multiplication because children learn to partition numbers into a grid of boxes. The answers of each multiplication calculation (150 and 35) then need to be added, to find the answer, which is 185. 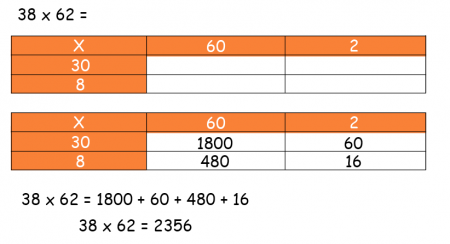 In Years 4 and 5 children move onto multiplying a two-digit number by another two-digit number. The four numbers would then be added, using whichever method the child is familiar with. Again, the numbers need to be partitioned up and put in a grid. Then the 6 is multiplied by each of the three numbers to make the answers. The numbers then need to be added to produce the answer. It is very important when using the grid method to multiply amounts of money that children remember to keep writing £ or p next to the numbers so that they do not get confused about which unit of money they are dealing with. Then, because the 4 was actually 0.4, the answer needs to be divided by ten, so the answer is 2.8. However usually, at this stage, a child would use long multiplication (also called column multiplication) as a quicker method for these larger numbers.